Nino: Now... tell me. Who started the war? Chiki: [long pause] We did. In the case of this movie, the Oscar was well deserved. The film was nominated in the wrong category, though ('Best Foreign Language Film'). It should have been up for 'Best Picture', 'Best Original Screenplay', 'Best Director - and it should have won all of those. As far as I'm concerned, this may very well be the finest film on the subject of war - or conflict in general - that was ever made. 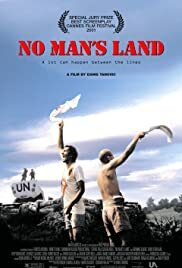 I've never seen anything similar; this film manages to show so many aspects of war, of human nature; it somehow manages to capture the essence of something that is inexplicable. Truly one of a kind and a must-see. And don't think for one second that this is some pretentious drivel or slow art-house fare - this is very much the opposite. 10 out of 10. 63 of 77 people found this review helpful. Was this review helpful to you?